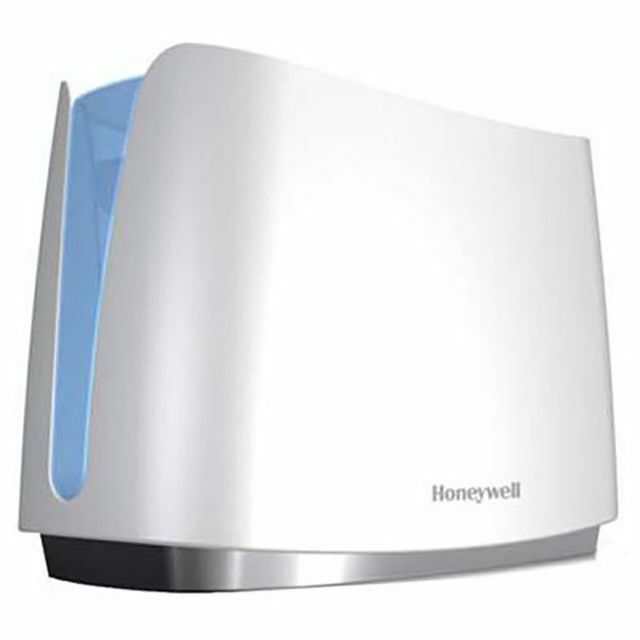 The Honeywell HCM-350 Germ-Free Cool Mist Humidifier is a quiet, efficient, easy-to-use humidifier for larger rooms that both experts and owners say is a good all-around pick. It has a 1.1-gallon tank and is best suited for spaces up to 500 square feet. This is an evaporative humidifier, so it won’t leave a thin film of white dust around the room if it’s used with hard water. An ultraviolet light inside the unit aims to kill any mold, fungus, or bacteria, though experts say this feature is probably overblown. Ease of use is the HCM-350’s strong suit. Controls are simple: There is one dial that’s used to select from three fan speeds. Owners say the tank is easy to fill thanks to its thoughtful design. The filling hole is large, minimizing the chance of water spraying everywhere, and there’s an easy-to-grip handle that makes carrying the tank a cinch. The large opening also means the tank is simple to clean, and reviewers say the lack of nooks and crannies in the base helps fight any buildup of gunk and grime. The base is top-shelf dishwasher safe. The HCM-350 also gets raves for quiet operation, making it a good pick for bedrooms. 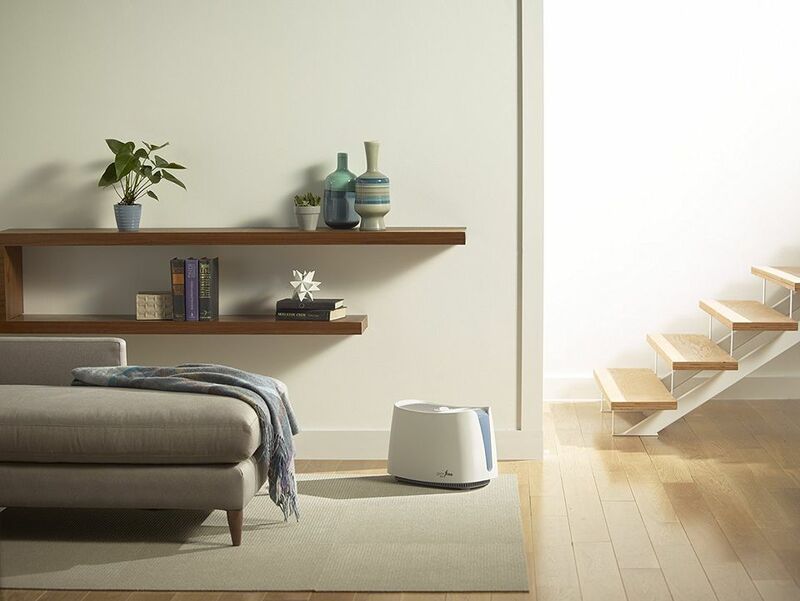 Reviewers say the best-selling Pure Enrichment Ultrasonic Cool Mist Humidifier is a great bedroom pick for a number of reasons: It’s quiet, compact, easy to use, and effective. The 0.4-gallon tank is quite small, but most users say they don’t have to refill it more than once a day if it’s used only while sleeping. Reviewers like the Ultrasonic Cool Mist’s simple one-button controls. It also has an automatic shutoff and a nozzle that can be rotated 360 degrees, letting users direct moisture where it’s most needed. The optional blue nightlight gets mixed feedback: Some users say it’s soothing, while others find it too bright. While most say this humidifier is easy enough to fill, the small opening may make scrubbing inside the tank difficult. A cleaning brush comes with the unit, but users say it’s more useful for the base. The TaoTronics Ultrasonic Cool Mist Humidifier checks all the boxes a cool mister should, but it doesn’t have the price tag to reflect it. At a low price, this humidifier emits vapor that improves the air to help you breath clearer. Bonus: It has the added effect of keeping skin healthy and hydrated. Since it operates on a super-stealthy level (re: quietly), it’s perfect for light sleepers or office use. To use, two 360 degree nozzles are included to mist in two different directions. Once the water tank is low, the machine auto-detects to shut-off. But rest assured, the 3.5 liter water tank will last you up to 10 hours, so frequent refills aren’t needed. Users especially appreciate this lasting quality, in addition to its easy clean design. They also claim that the small and absorbent filter helps reduce the mildew growth cool misters typically acquire. Paired with a quiet operation and the ability to control mist emissions, users are quite excited about the value behind this option. With a coverage area of up to 3,600 square feet, the Essick Air Aircare MA1201 is powerful enough to moisten the air in the entire house. It has a large 3.6-gallon tank and is capable of an impressive 12-gallon daily output. Experts say it lives up to its billing, giving it high marks for both output and efficiency. Users love that the MA1201 has a digital humidistat, meaning it can be set to automatically maintain a certain level of humidity in your home. There are also several manual fan speeds, and reviewers say controls are simple. They also say the side-mounted water tank is easy to remove, fill, and clean. Noise, however, is the weak spot here. The MA1201 got low rankings for noise in expert tests, and users confirm the fan is loud. However, many say it’s just white noise that they quickly got used to. Buyers of this product are a big fan of the build, which is considered “mid-sized” compared to other models. Despite this, it still has a large water tank. Throughout the reviews, the main source of conversation stems from the silent operation and lack of light or flashing features — both big advantages when it comes to securing a restful night’s sleep. But of course, the design was the biggest factor behind why people went with the URPOWER 5L Ultrasonic Cool Mist Humidifier in the first place. For those interested in a warm mist option, the Vicks Warm Mist Humidifier is a great pick. Like the Honeywell HCM-350, it can cover most large rooms around 500 square feet, however, it does have a smaller tank capacity than this front running model. That said, users still give it a great rating for effectiveness during the colder months to help combat colds. The Vicks Warm Mist Humidifier model has two settings for maximum or standard moisture, depending on the need. Its tank uses a boiling chamber to emit a steam vapor and produce a 95% bacteria-free mist into the air for up to 12 hours. There’s even an option to program it to automatically shut-off. When you get sick, this product has you covered. Since there’s a medicinal cup available to fill with Vicks VapoSteam, you can finally get that sleep you need. In contrast to the Honeywell product, this one has been known to produce mold or mildew as a side effect to the hot steam released. However, users say the tank is easy to clean when this occurs. Additionally, this option doesn’t release a “white fog” like most cooler misters typically do. Since it’s especially effective during cold season, experts give it the highest rating for its health and seasonal benefits. Just because you’re on the go doesn’t mean you should suffer through bad air quality. From nights in hotels to hopping off a plane, the VAVA Cool Mist Humidifier is an easy travel option to take with you wherever you go. Unlike bulky humidifiers, this one is designed with a slim and sleek build to fit snugly into tight spaces. At 60 ounces, it’s your best bet for a better night’s sleep. The VAVA Cool Mist Humidifier features an easy-to-use knob control to mist at a full 360 degrees. It operates noise-free until the 1.8L tank is empty, automatically shutting off for safer use. Experts say it has a generous water tank given its size. Many also rave about the style, which looks great on a bedside table. They do warn that refilling the tank can be messy, but they say the stylish stature makes up for this quality. Choosing a humidifier for a nursery can be a tough task. You want something that is effective, easy to clean, and also functions at a very low decibel. Babies and small children need a humidifier in their room to help keep their nasal passages from drying out which can lead to them getting sick more often. If you are in the market for one, Crane is a great company to check out. The drop humidifier provides you with a 1-gallon filter-free construction that can run for up to 24-hours. Of course, you don't want a loud humidifier that can wake your child so this option is great because it is almost silent as it produces a nice cool mist for your child's room. Reviewers love that this can provide moisture for up to 500 square feet and that this isn't so ugly to look at. Cleaning it is fairly easy compared to other models they have also tried. Perhaps you want the ability to not only add some moisture to your small space but also a nice spa-like scent. If you want a 2-in-1 humidifier you might want to shop for an oil diffuser that can also function as a humidifier. This Amazon Choice has over 28,000 reviews from people loving how this can relieve any dry symptoms in a bedroom or small office and also else help you relax when you add essential oils (not included). This diffuser also has seven different LED color-changing lights so you can even more ambiance to your space. Another plus is this comes with a cup that you can fill up at the sink with water so you don't have to lug the whole unit to your bathroom. Just note, this unit is small so it will only work in very small spaces for a limited amount of time. Check out our other reviews of the best oil diffusers available on the market today. Your humidifier needs may change over time, so why not splurge on this do-it-all option from LEVOIT? The humidifier can release cold or warm mists, so you can use it to relieve your sinuses, keep your skin hydrated, and more. This humidifier has a remote for easy use no matter where you are in the room and it holds 5.5 liters of water so you can use it for 36 hours straight without having to refill the tank. A special sensor controls the amount of mist released in order to keep your room feeling just right. What's more, this LEVOIT model has an aromatherapy diffuser for essential oils. If you want a powerful, easy-to-use, reliable humidifier, you should consider investing in this option. We bought three top-rated humidifiers that our reviewers tested for 120 hours. We asked our testers to consider the most important features when using these humidifiers, from their coverage area to their maintenance. We’ve outlined the key takeaways here so that you, too, know what to look for when shopping. Mist Warm mist humidifiers boil water to create moisture, posing a safety risk for kids. If that’s a concern, opt for cool mist humidifiers. The most basic are evaporative, but they produce a heavier mist. Ultrasonic and impeller humidifiers, also cool mist humidifiers, are more expensive, but produce high-quality fine mist. Capacity Coverage area — also known as a humidifier’s capacity — is measured in square footage. Measure your space first (a unit that’s too big can cause condensation), but portable units rated for up to 700 square feet are generally suitable for a bedroom. Maintenance Because of the warm, wet environment they create, all humidifiers require regular cleaning to prevent the spread of bacteria. Warm mist humidifiers require slightly less maintenance, since they don’t require filters. Cool mist filters should be changed every 1-2 months. Our testers loved that this humidifier has a fan so it “can cool down the temperature as well as adjust the air quality.” One of our reviewers also observed, “It's very sturdy, so you don't have to be worried you'll knock it over and spill the water.” However, because of its size, our testers found it more difficult to store than other models. One of our reviewers also said she spilled water when trying to move it because the bottom detached. The overall value, though, was a major plus: “It's a good price for a machine that is more like a humidifier and a fan in one,” explained one of our testers. “It works well and intuitively at a good price point,” declared one of our testers about the TaoTronics Ultrasonic Cool Mist Humidifier. Notable features, according to our reviewers, included the dual nozzle to target the mist in different locations, a built-in water purifier, and the power dial to adjust the mist strength. On the other hand, our testers wished it were more modern looking, and one of our reviewers noticed it leaked a little from the bottom.